Cypress Industries has added a printed circuit board division to their offerings. 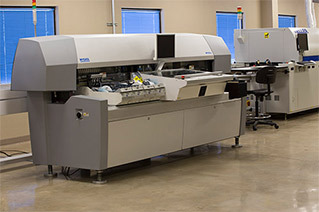 The division, based in their Austin, TX facility, is lead by PCB assembly specialists with more than 15 years of experience in circuit board manufacturing. "From PCB prototypes to high-volume PCB production, we are structured to prioritize every customer's PCB assembly needs," says PCB Division Manager Toby Pickerill. "We can handle every aspect of your PCB assembly or work with your kit and files to manufacture both small and large volume PCB assemblies," says Pickerill. "We can also manufacture a wide range of printed circuit boards with varied dimensions, layers and thicknesses, single-sided PCB and double-sided PCB." Cypress Industries is positioned as a one-stop solution for electronics manufacturing. From circuit board manufacturing to metals to plastics and cables, they specialize in manufacturing multiple components in order to save clients time and money. Cypress Industries' printed circuit board department is electrostatic discharge managed, environmentally controlled, RoHS compliant and ITAR and IPC-610 certified. Cypress Industries is a leading, vertically-integrated contract manufacturer. Our capabilities include printed circuit board assemblies, sheet metal, electromechanical assemblies, custom cable assemblies, wire harnesses, machining, and plastic injection molding. Other core competencies include design for manufacturability and value engineering. Our vertical integration enables us to be a one-stop shop for customers, while our multiple manufacturing locations give customers flexibility and pricing options. Wholly-owned manufacturing facilities in Texas, Mexico and India give us the ability to service customers across the globe.